Hear how iCabbi is transforming clients’ businesses. Switching to iCabbi has enabled our clients to grow, to cut costs, to increase profits and secure the future of their business. “iCabbi has a lot of great features, especially the DiSC telephone system, the app and the web booking system. And with the web booking and app booking system, bookings come straight to us and onto the iCabbi system. One very big plus point is having an app for customers, as well as the web booker. It is pushing up bookings because younger customers want the app and we can now tell them that we have an app. It makes things a lot easier for us. After just 8 months with iCabbi our app bookings are growing all the time, our target is to have 25% of bookings with the app, web bookings or IVR. Another feature that we like a lot is that we can have as many companies as we want on iCabbi, as we have 6 different companies covering different areas. We can easily add as many companies from different areas as we want. Before iCabbi, we were always confused about how many jobs we got from area to area, now we know exactly what jobs come from which area. 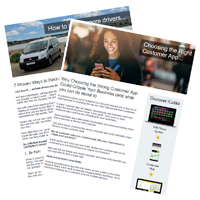 The drivers like iCabbi a lot – they like the accuracy because it takes them to the right pickup address. “Our office staff are really pleased with iCabbi, the drivers are really pleased with it and the local licencing office who were getting on our backs about record keeping are very pleased with iCabbi as well. The on-boarding, training and support has all been brilliant. Hillary arranged everything in the first place, which was great. The support team must have found some of the questions we have been asking a bit strange, it must be a bit frustrating for them because they’re on top of their game, but they know exactly what they’re doing, they’ve all been a huge help to us. The training was comprehensive, it was kept simple, and they’ve been with us since day one, giving us everything we’ve needed. We’ve been able to phone up and there hasn’t been anything that they haven’t been able to sort out for us. They’ve just been there and have sorted things out straight away, absolutely no problem.